"White birch" redirects here. For other uses, see White birch (disambiguation). B. lenta var. papyrifera (Marshall) Castigl. Leaves are doubly serrate with sharp teeth. It is a medium-sized deciduous tree typically reaching 66 feet (20 m) tall, and exceptionally to 130 feet (40 m) with a trunk up to 30 inches (76 cm) in diameter. Within forests it often grows with a single trunk but when grown as a landscape tree it may develop multiple trunks or branch close to the ground. Paper birch is a typically short lived species. It handles heat and humidity poorly and may only live 30 years in zones six and up, while trees in colder-climate regions can grow over 100 years. B. papyrifera will grow on many soil types, from steep rocky outcrops to flat muskegs of the boreal forest. Best growth occurs on deeper, well drained to dry soils depending on the location. In older trees the bark is white, commonly brightly so, flaking in fine horizontal strips to reveal a pinkish or salmon colored inner bark. It is often with small black marks and scars. In individuals younger than five years, the bark appears a brown red color with white lenticels, making the tree much harder to distinguish from other birches. The bark is highly weather-resistant. It has a high oil content and this gives it its waterproof and weather resistant characteristics. Often, the wood of a downed paper birch will rot away leaving the hollow bark intact. The leaves are dark green and smooth on the upper surface, the lower surface is often pubescent on the veins. They are alternately arranged on the stem, oval to triangular in shape, 5–10 cm (2–4 in) long and about ​2⁄3 as wide. The leaf is rounded at the base and tapering to an acutely pointed tip. The leaves have a doubly serrate margin with relatively sharp teeth. Each leaf has a petiole about 2.5 cm (1 in) long which connects it to the stems. The fall color is a bright yellow color which contributes to the bright colors within the northern deciduous forest. The leaf buds are conical and small and green-colored with brown edges. The stems are a reddish-brown color and may be somewhat hairy when young. The flowers are wind-pollinated catkins, the female flowers are greenish and 1.5 inches (3.8 cm) long growing from the tips of twigs. The male (staminate) flowers are 2–4 inches (5–10 cm) long and a brownish color. It flowers from mid-April to June depending on location. Paper birch is monoecious, meaning that one plant has both male and female flowers. The roots are generally shallow and occupy the upper 24 inches (60 cm) of the soil and do not form taproots. High winds are more likely to break the trunk than to uproot the tree. B. papyrifera hybridizes with other species within the genus Betula. 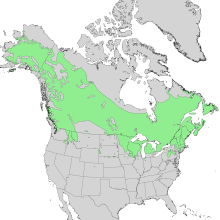 Betula papyrifera is mostly confined to Canada and the far northern United States. It is found in interior (var. humilus) and south-central (var. kenaica) Alaska and in all provinces and territories of Canada, except Nunavut, as well as the far northern continental United States. Isolated patches are found as far south as the Hudson Valley of New York and Pennsylvania, as well as Washington. High elevation stands are also in mountains to North Carolina, New Mexico, and Colorado. The most southerly stand in the Western United States is located in Long Canyon in the City of Boulder Open Space and Mountain Parks. This is an isolated Pleistocene relict that most likely reflects the southern reach of boreal vegetation into the area during the last Ice Age. In Alaska, paper birch often naturally grows in pure stands by itself or with black or white spruce. In the eastern and central regions of its range it is often associated with red spruce and balsam fir. It may also be associated with big-toothed aspen, yellow birch, Betula populifolia, and maples. Shrubs often associated with paper birch in the eastern part of its range include: beaked hazel (Corylus cornuta), common bearberry (Arctostaphylos uva-ursi), dwarf bush-honeysuckle (Diervilla lonicera), wintergreen (Gaultheria procumbens), wild sarsaparilla (Aralia nudicaulis), blueberries (Vaccinium spp. ), raspberries and blackberries (Rubus spp. ), elderberry (Sambucus spp. ), and hobblebush (Viburnum alnifolium). Betula papyrifera is a pioneer species, meaning it is often one of the first trees to grow in an area after other trees are removed by some sort of disturbance. Typical disturbances colonized by paper birch are wildfire, avalanche, or windthrow areas where the wind has blown down all trees. When it grows in these pioneer, or early successional, woodlands it often forms stands of trees where it is the only species. Paper birch is considered well adapted to fires it recovers quickly by means of reseeding the area or regrowth from the burned tree. The lightweight seeds are easily carried by the wind to burned areas where they quickly germinate and grow into new trees. Paper birch is adapted to ecosystems where fires occur every 50–150 years For example, it is frequently an early invader after fire in black spruce boreal forests. As it is a pioneer species, finding paper birch within mature or climax forests is rare as it will be overcome by the more shade tolerant trees as secondary succession progresses. As an example, in Alaskan boreal forests, a paper birch stand 20 years after a fire may have 3,000–6,000 trees per acre (7,400–14,800/ha), but after 60–90 years the number of trees will decrease to 500–800 trees per acre (1,200–2,000/ha) as spruce replaces the birch. After approximately 75 years the birch will start dying and by 125 years most paper birch will have disappeared unless another fire burns the area. Paper birch trees themselves have varied reactions to wildfire. A group, or stand, of paper birch is not particularly flammable. The canopy often has a high moisture content and the under story is often lush green. As such, conifer crown fires often stop once they reach a stand of paper birch or become slower moving ground fires. Since these stands are fire resistant they may become seed trees to reseed the area around them which was burned. However, in dry periods paper birch is flammable and will burn rapidly. As the bark is flammable it will often burn and may girdle the tree. Birch bark is a winter staple food for moose. The nutritional quality is poor due to the large quantities of lignin, which make digestion difficult, but is important to wintering moose because of its sheer abundance. Moose prefer paper birch over aspen, alder, and balsam poplar but they prefer willow (Salix spp.) over birch and the other species listed. Although moose consume large amounts of paper birch in the winter, if they were to only eat paper birch they may die. Although white-tailed deer consider birch a "secondary-choice food", it is an important dietary component. In Minnesota, white-tailed deer eat considerable amounts of paper birch leaves in the fall. Snowshoe hares browse paper birch seedlings. Porcupines feed on the inner bark of the tree and beavers will also feed on the tree. The seeds of paper birch are an important part of the diet of many birds and small mammals including chickadees, redpolls, voles, and ruffed grouse. Yellow bellied sapsuckers drill holes in the bark of paper birch to get at the sap, this is one of their favorite trees for feeding on. The species is considered vulnerable in Indiana, imperiled in Illinois, Virginia, West Virginia and Wyoming, and critically imperiled in Colorado and Tennessee. Betula papyrifera has a moderately heavy, white wood. It makes excellent high-yielding firewood if seasoned properly. The dried wood has a density of 37.4 lb/cu ft (0.599 g/cm3) and an energy density 20,300,000 btu/cord. While paper birch does not have a very high overall economic value, it is used in furniture, flooring, popsicle sticks pulpwood (for paper), plywood, and oriented strand board. The wood can also be made into spears, bows, arrows, snowshoes, sleds and other items. When used as pulp for paper, the stems and other non trunk wood are lower in quantity and quality of fibers and consequently the fibers have less mechanical strength, nonetheless, this wood is still suitable for use in paper. The sap is boiled down to produce birch syrup. The raw sap contains 0.9% carbohydrates (glucose, fructose, sucrose) as compared to 2-3% within sugar maple sap. The sap flows later in the season than maples. Currently, only a few small scale operations in Alaska and Yukon produce birch syrup from this species. Its bark is an excellent fire starter; it ignites at high temperatures even when wet. The bark has an energy density of 5740 cal/g and 3209 cal/cm3, the highest per unit weight of 24 species tested. Panels of bark can be fitted or sewn together to make cartons and boxes (a birchbark box is called a wiigwaasi-makak in the Anishinaabe language). The bark is also used to create a durable waterproof layer in the construction of sod-roofed houses. Many indigenous groups (i.e. Wabanaki peoples) use birch-bark for making various items such as canoes, containers and wigwams. Paper birch is planted to reclaim old mines and other disturbed sites, often bare-root or small saplings are planted when this is the goal. Since paper birch is an adaptable pioneer species it is a prime candidate for reforesting drastically disturbed areas. When used in landscape planting, it should not be planted near black walnut as the chemical juglone, exuded from the roots of black walnut, is very toxic to paper birch. It is frequently planted as an ornamental due to its graceful form and attractive bark. The bark changes to the white color at about 3 years of growth. Paper birch grows best in USDA zones 2-6, due to its intolerance of high temperatures. Betula nigra, or river birch, is recommended for warm-climate areas warmer than zone 6 where paper birch is rarely successful. B. papyrifera is more resistant to the bronze birch borer than Betula pendula which is similarly planted as a landscape tree. Birch skeletonizer is a small larva which feeds on the leaves and causes browning. Birch leafminer is a common pest which feeds from inside of the leaf and causes the leaf to turn brown, the first generation appears in May but there will be several generations per year. Severe infestations may stress the tree and make it more vulnerable to the bronze birch borer. When stressed, bronze birch borers may kill a tree. The insect bores into the sapwood, beginning at the top of the tree and causing death of the tree crown. The insect has a D shaped emergance hole where it chews out of the tree. Healthy trees are resistant to the borer but when grown in subideal conditions the defense mechanisms of the tree may not function properly. Chemical controls exist. It is the provincial tree of Saskatchewan and the state tree of New Hampshire. People sometimes vandalize the bark of this tree by carving into it with a knife or by peeling off layers of the bark. Both forms of vandalism can cause unsightly scars on the tree. ^ "Betula papyrifera". World Checklist of Selected Plant Families (WCSP). Royal Botanic Gardens, Kew. Retrieved 2012-10-10 – via The Plant List. ^ a b c d e Furlow, John J. (1997). "Betula papyrifera". In Flora of North America Editorial Committee. Flora of North America North of Mexico (FNA). 3. New York and Oxford – via eFloras.org, Missouri Botanical Garden, St. Louis, MO & Harvard University Herbaria, Cambridge, MA. ^ a b c "Betula papyrifera". Germplasm Resources Information Network (GRIN). Agricultural Research Service (ARS), United States Department of Agriculture (USDA). Retrieved 11 December 2017. ^ a b c d e f g h i j k l m n Uchytil, Ronald J. (1991). "Betula papyrifera". Fire Effects Information System (FEIS). US Department of Agriculture (USDA), Forest Service (USFS), Rocky Mountain Research Station, Fire Sciences Laboratory. Retrieved 5 July 2016 – via https://www.feis-crs.org/feis/. ^ a b c d e Dirr, Michael A (1990). Manual of woody landscape plants (4. ed., rev. ed.). Champaign, Illinois: Stipes Publishing Company. ISBN 0-87563-344-7. ^ a b c d e f g h i Burns, Russell M; Honkala, Barbara H. (1990). Sylvics of North America: Hardwoods. Washington: U.S. Dept. of Agriculture, Forest Service u.a. ISBN 0-16-029260-3. Retrieved 14 July 2016. ^ a b Ewing, Susan (April 1, 1996). The Great Alaska Nature Factbook. Portland, Oregon: Alaska Northwest Books. ISBN 978-0-88240-454-7. ^ Rhoads, Ann; Block, Timothy. The Plants of Pennsylvania (2 ed.). Philadelphia Pa: University of Pennsylvania press. ISBN 978-0-8122-4003-0. ^ Cooper, David J. (Spring 1984). "Ecological Survey of the City of Boulder, Colorado Mountain Parks" (PDF). City of Boulder Parks and Recreation Department: 16. Archived from the original (PDF) on 2011-09-05. Retrieved 2011-09-16. ^ Hogan, C. Michael (2008). "Black Spruce (Picea mariana)". GlobalTwitcher. Archived from the original on 2011-10-05. Retrieved 2011-09-16. ^ "Wood – Combustion Heat Values". www.engineeringtoolbox.com. Retrieved 5 July 2016. ^ Bellis, Mary. "Popsicle – The History of the Popsicle". About.com. Retrieved 2011-09-16. ^ a b c d "Betula papyrifera - Paper Birch" (PDF). Retrieved 5 July 2016. ^ "Fast New Hampshire Facts". NH.gov. Retrieved August 28, 2012. Wikimedia Commons has media related to Paper Birch. This page was last edited on 23 February 2019, at 18:46 (UTC).